This shop has been compensated by Collective Bias, Inc. and its advertiser. All opinions are mine alone. #AvengersUnite #CollectiveBias I guess it was inevitable that in a house full of boys, we would become huge superhero fans. Even my daughter has gotten into the spirit of things. 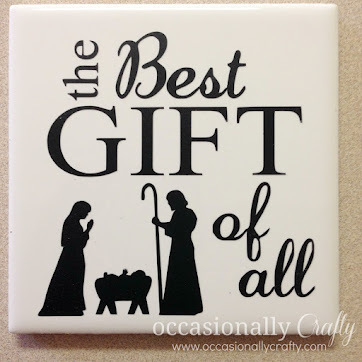 We have taken all our kids to see the movies, we buy the DVD's, and we even have some toys and other goodies featuring our favorite characters. Of course we purchased MARVEL's The Avengers: Age of Ultron the first day it came out (last Friday!) We picked it up at Walmart for an awesome price, then decided to grab some Halloween costumes too. 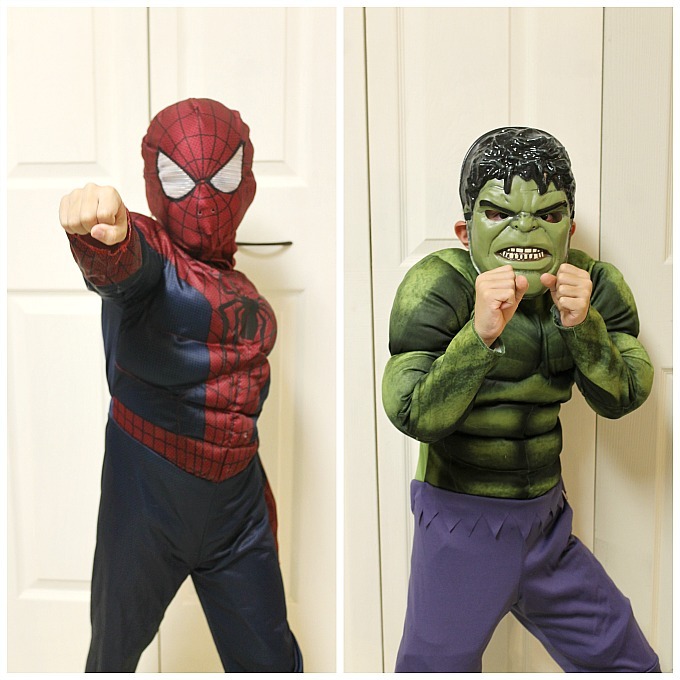 My kids actually have other costumes picked out, but they love to play dress-up, so we made sure to grab Spider-Man and The Hulk. My daughter wanted Black Widow, but they didn't have it in any of our local stores. We settled for ordering it online and will pick it up later this week. Both the costumes and the DVD were easy to find. The Boy's Licensed Halloween costumes were full of these costumes, and the DVD/Blu-Ray were right at the front of the store. I thought it would be fun to celebrate the DVD release of MARVEL's The Avengers: Age of Ultron by making my kids some pillowcases featuring their favorite characters. 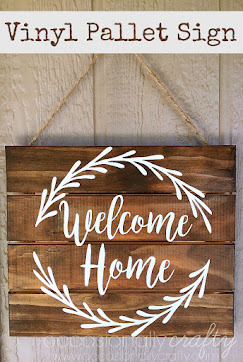 We have movie nights in our living room where everyone settles in with their pillows and blankets, so this would be a perfect treat for our movie night! 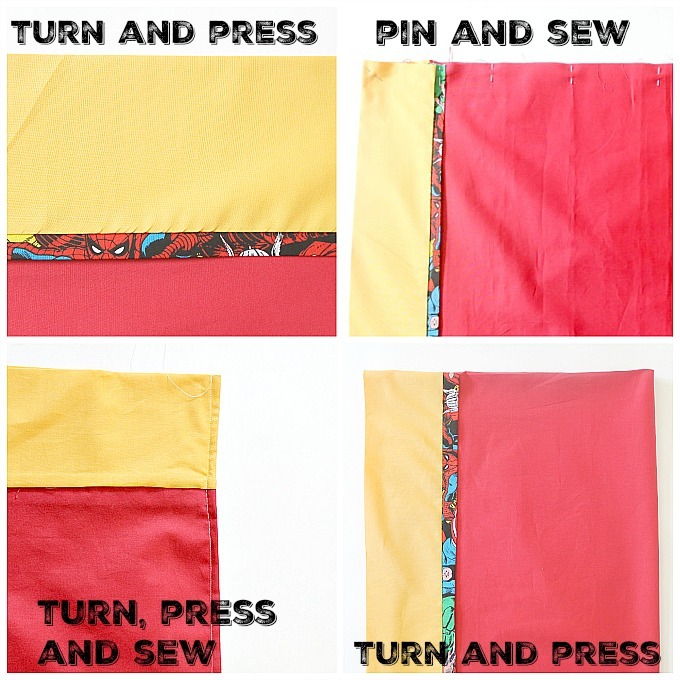 I don't even sew that much, but my friend showed me a super-easy way to make cute pillowcases awhile back, and I used her instructions to make up this tutorial. 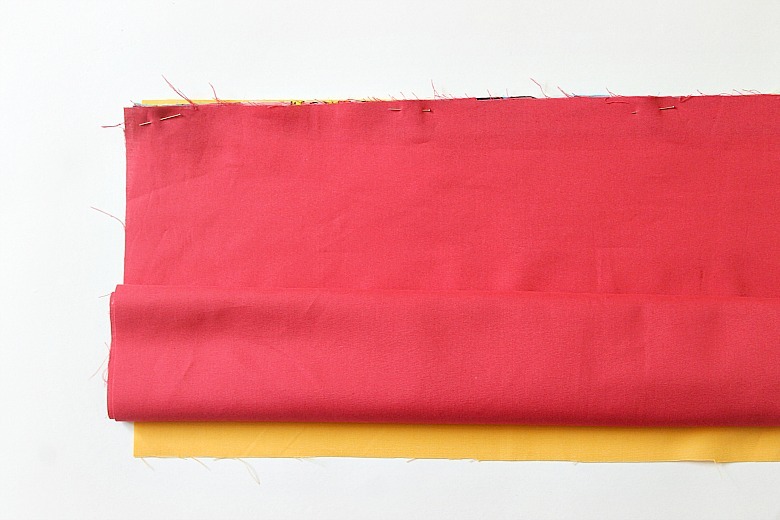 You will need three fabrics: Main Body: 1 yard Trim: 1/4 yard Cuff: 1/3 yard Coordinating thread Sewing Machine Scissors My colors are red for the main body, Avenger fabric for the trim, and gold for the cuff. 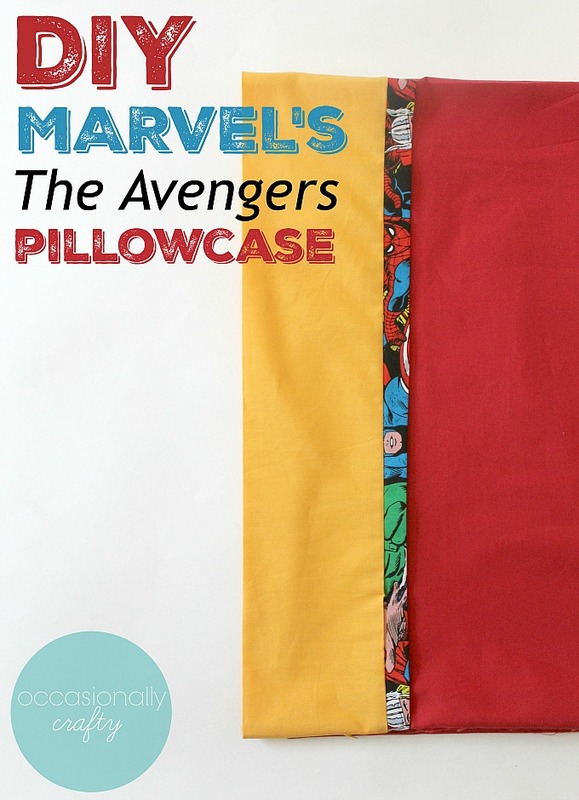 This makes a really cute Iron Man-themed pillowcase. 1. 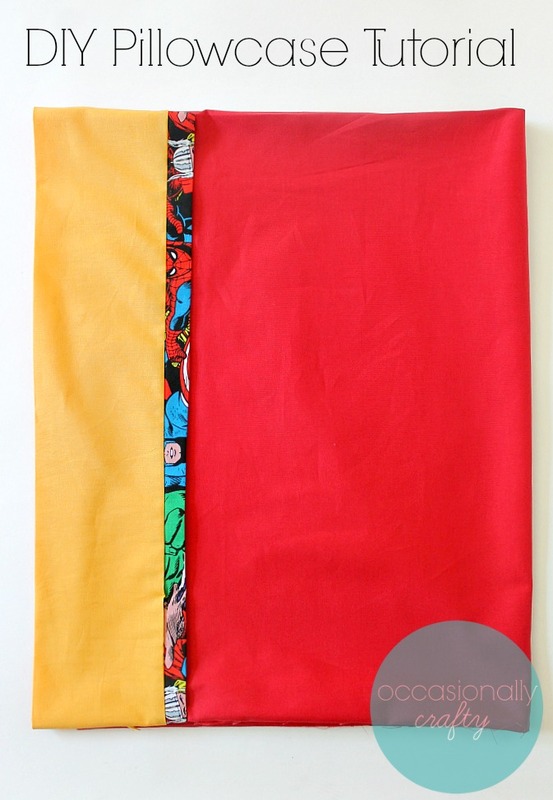 Cut your fabric as follows: Main Fabric- 27"x40" Trim: 2" x 40" Cuff Fabric: 9"x40"
2. Lay the cuff out flat with the right or printed side facing up. If you have a solid color it doesn't really matter which side is up. 3. Fold your trim fabric together, wrong sides together, and press. 4. Place the open edge of the trim fabric along the top of the cuff fabric and pin in place to hold. 5. Place the body fabric on top of the trim and cuff fabric with right sides together, and pin in place. 6. Starting at the bottom of the body fabric, roll it up gently until the bottom of the cuff fabric is showing. 7. Take the bottom edge of the cuff fabric and pull it up and over the rolled body fabric. Match it with the top of the other fabrics and pin through all layers. 8. Sew along the raw edge with a 3/8" seam allowance. 9. 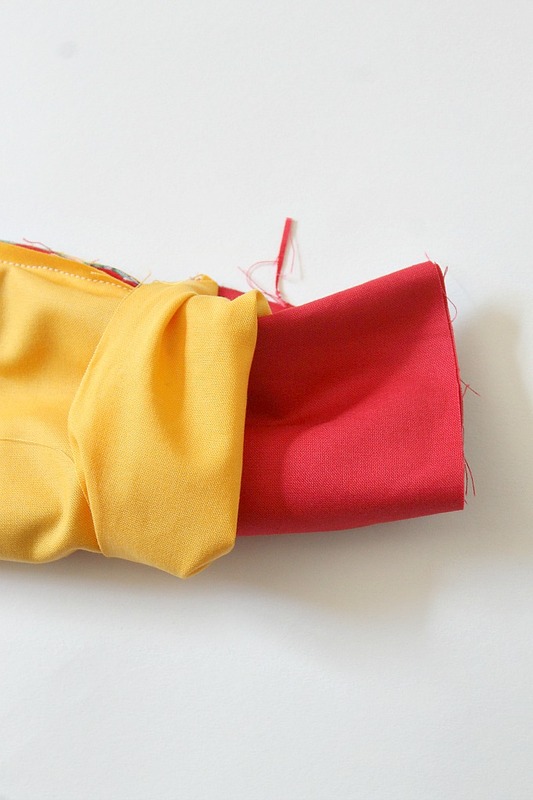 Carefully fold back the cuff and pull the body of the pillowcase out. Press the cuff and trim flat. Now you have to sew the two remaining sides together. 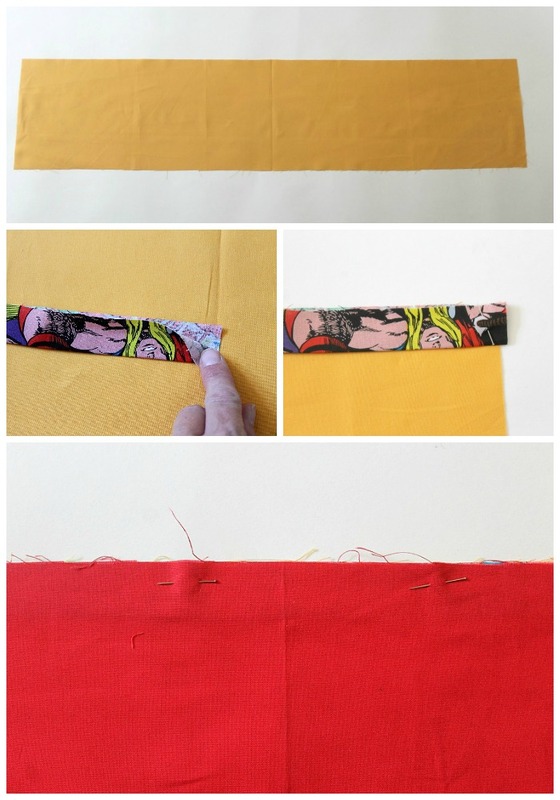 This method details how to do a french seams so there are no frayed edges on the inside of the fabric. (See collage below instructions for pictures) 1. Fold the pillowcase in half, with WRONG SIDES together, making sure to match up the trim and cuff fabrics. Pin in place, then continue pinning down the side and around the bottom. 2. Use a 1/4" seam allowance to stitch down the side and around the bottom. 3. Trim the corner, then turn the pillowcase inside out so RIGHT SIDES are now together. Press (and if desired, pin) the side and bottom seams. 4. Stitch the side and bottom with a 1/2" seam allowance. 5. Turn the pillowcase right side out and press all seams. You can use a chopstick or something to press out any corners. I have a Spider-Man one (red, blue, and Avengers fabric), and Iron Man one (red, gold, and Avengers fabric), and am making my daughter a more feminine Captain America one (red and white polka dot fabric, blue printed fabric, and Avengers fabric). 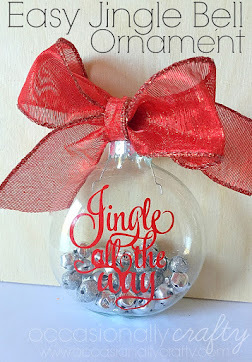 This is so easy and looks fabulous. There is no limit to what kind of pillowcase you could create with this! 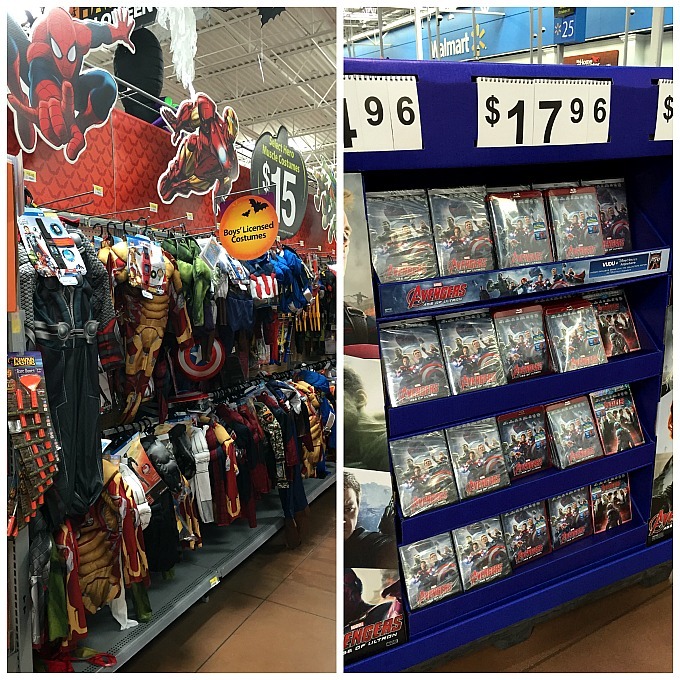 Be sure to check out all the awesome Avengers costumes at Walmart! 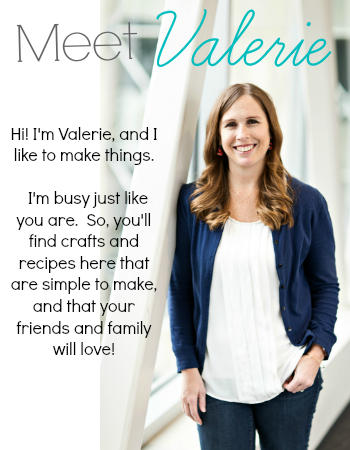 What are your kids going to be for Halloween?